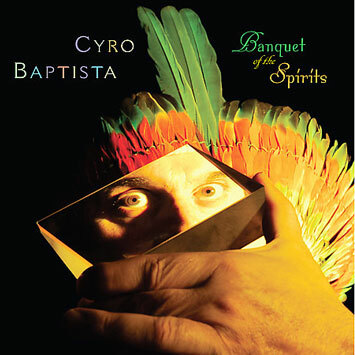 Banquet of the Spirits features the tight new quartet led by maestro Cyro Baptista- the fabulous percussionist who has performed with everyone from Herbie Hancock and Yo-Yo Ma to Laurie Anderson, Paul Simon and Medeski, Martin and Wood. Cyro's endless sonic curiosity and intense rhythmic drive has never been stronger in these fabulous and imaginative original songs. Featuring three of the best young musicians out of the downtown scene and some very special guests, the music jumps from a whisper to a scream and never misses a beat. Delightful music from one of the world's greatest and most adventurous Brazilian musicians. Banquet of the Spirits features the tight new quartet led by maestro Cyro Baptista-the percussionist who has performed with everyone from Herbie Hancock and Yo-Yo Ma to Laurie Anderson, Paul Simon and, Medeski Martin and Wood. Cyro's endless sonic curiosity and intense rhythmic drive has never been stronger in these imaginative original songs. Featuring three of the best young musicians out of the downtown scene and some very special guests, the music jumps from a whisper to a scream and never misses a beat. The quartet embodies the philosophy of Anthropofagia, a Brazilian cultural movement from the 1920's. The band, is a musical manifestation of the process of eating, swallowing, and digesting all the tendencies that are part of the sonic landscape and our environment. The music is the product of all sounds that they have collectively consumed over the years; some of them they've digested and others they have rejected. After that, it has been difficult to identify what belongs to what country, culture, or religion.